Reba Sharon Brown passed away peacefully at her home on May 29, 2018. She was born at her parent’s home in White Cloud on August 24, 1941 to Ray and Hazel (Pate) Brown. She was preceded in death by her parents, her sister Earlene Engleman, and brothers, Neely and Delmar Brown. Reba is survived by her brother, Darrel Brown, of Corydon, sister-in-law, Nelma Brown, of La Crosse, WI., and sons Randy (Sherry) of Corydon, DeNeil (Debbie) of Laconia and Travis (Beth) of Mooresville, IN. She was blessed with 8 grandchildren and 7 great grandchildren. 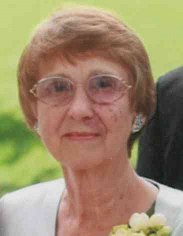 She was a former employee of Old Capital Bank and retired in 2010 from First Savings Bank. She was an active member of Trinity Assembly of God and enjoyed volunteering her time. Funeral services will be at 3:00 p.m. Friday, June 1, 2018, at Beanblossom-Cesar Funeral Home in Corydon. Burial will be in Cedar Hill Cemetery in Corydon. Visitation will be from 10:00 a.m. – 3:00 p.m. Friday at the funeral home. Pallbearers are Isaac Brown, Jonathan Brown, Scott Richards, Seth Thompson, Shane Brown and Zachary Brown.